"The attached photo is of my right ankle, three days after I got a funeral tattoo for my great friend, Justin Hilbun. Justin died in a one-car crash in his early thirties, and was the first of my friends whose death I would classify as 'sudden' and 'too soon.' His jazz funeral was held in the French Quarter on 6-5-09, and I couldn't be there, so I got this ink for him that day instead. 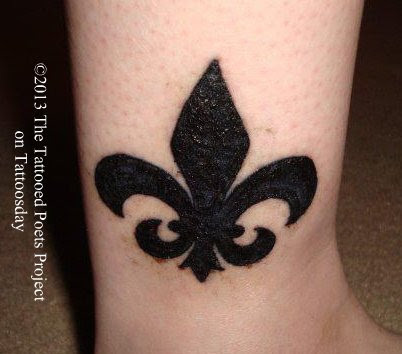 It's a fleur-de-lis, because that's the symbol of NOLA and when I think of Louisiana, I think of Justin. He was a very talented musician, and when he died, he was working on an album that you can listen to here: http://justinhilbun.bandcamp.com/. The tattoo is just a straightforward tracing job, but I went to get it from a lady I'd worked with before: Danielle Distefano, the owner of Only You Tattoo [in Atlanta]. She wasn't there that day, and I had to get it done that day, so I went with Chuck Donoghue. I talked about Justin the whole hour, and Chuck really respected what I was there to do." Megan Volpert is a high school English teacher who lives in Atlanta. The poem printed here is forthcoming in her fifth book, Only Ride (Sibling Rivalry Press, 2014). Predictably, meganvolpert.com is her website. If you are reading this on another web site other than Tattoosday, without attribution, please note that it has been copied without the author's permission and is in violation of copyright laws.